This species, called "Island poppy" on the California Native Plant Society Rare and Endangered Plant Inventory, occurs on the California Islands, from San Miguel Island south to Cedros Island, and possibly on Guadalupe Island. It is similar to E. caespitosa, but the divisions of the leaves spread at a greater angle, giving the foliage a very different appearance. It is a tetraploid, with a chromosome number of n=12, and may be a polyploid derivative of a mainland species, perhaps E. caespitosa. PLANT annual, 0.5-3 dm tall, erect, glabrous or glaucous. LEAVES basal and cauline, terminal divisions obtuse. INFLORESCENCE cymose or solitary. 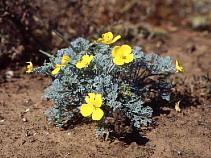 FLOWERS erect in bud; receptacle conic; calyx short-pointed, glabrous or glaucous; petals 0.5-2 cm long, yellow, sometimes with orange spot at base. FRUITS 4-7 cm long. SEEDS 1.4-1.6 mm diam, ellipsoidal, reticulate, brown. 2n=24. UNCOMMON. Open places, especially in chaparral; 0-300 m. California Channel Islands; s to Pacific islands of Baja California Sur.